This week I came across Steem and I instantly got sucked into it. In this post am trying to summarize what I learned about it so far. You can think of Steem as a Facebook-like platform where authors and curators can earn cryptocurrency rewards by writing posts, up-voting posts, commenting on posts and up-voting comments. Steem – the fundamental unit of account on the Steem blockchain. All other tokens derive their value from the value of STEEM. Generally speaking STEEM should be held for short periods of time when liquidity is needed. Someone looking to enter or exit the Steem platform will have to buy or sell STEEM. 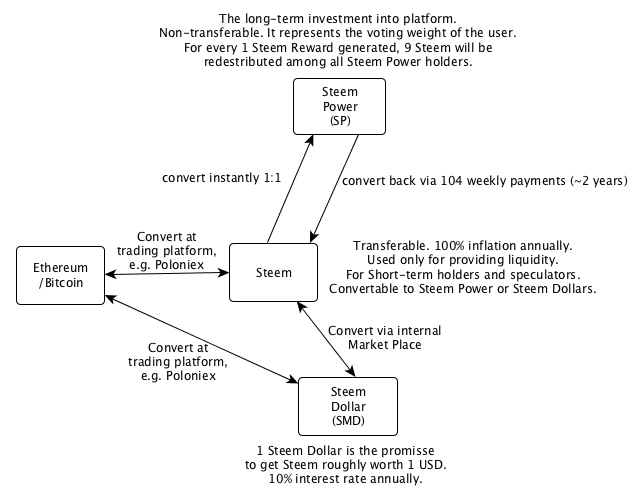 Once STEEM has been purchased it should be converted into Steem Power (SP) or Steem Dollar (SMD) to mitigate the impact of dilution over the long-term (100% inflation annually). the user can participate on the platform by voting or posting articles/comments. This is rewarded by more Steem Power (SP) and Steem Dollars (SMD). How much everyone gets, depends on his Steem Power and the voting algorithm. The inflation is not 100% anymore like with Steem, but only ~10% per year because for every 1 Steem generated as reward, 9 new Steem are distributed among Steem Power holders. If the platform grows faster than the inflation, investors make a win, otherwise they’ll be losing money. Steem Dollar (SMD) – represents a number of Steem tokens having a value of ~1 USD. It can be used to trade goods/services with the stability of the USD. SMD pays holders interest (currently 10% per year). The interest rate is set by the same people who publish the price feed so that it can adapt to changing market conditions. The two main reward mechanisms in Steem are curation and author rewards. Both are equally important in Steem. Author Rewards are gained by posting articles that are upvoted by others. Curation Awards are gained by early upvoting articles that grow popular later. The rewards are payed out in Steem Power and Steem Dollars. In general the more Steem Power someone holds, the more weight his vote has. If one of developers is upvoting a post, it can instantly bring more than $100 value to the post. A new account on the other side with ~3 Steem Power will only bring a fraction of a cent. The final value of a post is distributed among the author and curators depending on how early they participated in the voting process and how much Steem Power their accounts hold. The money for the reward pool is coming from the inflation. Instead of taking a tax on existing accounts for generating the reward pools, the protocol generates continuously new Steem where 1 is going to the reward pool and 9 are redistributed to Steem Power holders. This basically results in a ~10% inflation annually. Lot of people are asking the question if this model is sustainable. One could expect that the model can only be profitable as long as more investors are jumping in. At the moment where supply gets greater than demand the whole system could break together like a Ponzi-Schema. This could be very painful for late-adoptors because of the 2 year payout mechanism. One of the main critical voices claiming that Steem is actually scam is Tone Vays. My personal impression so far is that this could be the first DLT application with good user experience and the potential to go viral. It reminds me a little bit on 2007 and the gold rush with the AppStore. At the time of writing this post, the platform has around 70k accounts. Try it yourself at https://steemit.com or read more about it at https://steem.io. Currently every new account gets Steem Power worth ~$4 for free. The number of blockchain news post is growing exponentially. Nearly every company or government does some research projects based on blockchain and DLT technologies. Let’s try to filter the stuff wich could be interesting for us blockchainers. Last year I saw a well written paper from the world economy forum about fintechs. This year they published “The future of financial infrastructure” witch focused on blockchain. The paper describes in detail a set of financial use cases and how they can be improved using blockchain tech. It’s one of the best papers we have seen so far. The next big thing is Raiden from Heiko Hees. See also International Business Timer. Every time you discuss the opportunities of blockchain and smart contracts with business people, very soon they come up with the scalability issue. Based on my IT project experience, I can tell that there is always a solution for every performance issue. Heiko’s Raiden is the solution for Ethereum. Finally we have to mention Steem – a blockchain database that supports community building and social interaction with cryptocurrency rewards. You can think of it as Facebook/Reddit like Plattform where content contributors and content curators are monetary rewarded for their work. It is questionable if the model is sustainable or not, anyway it’s the first application of the DLT tech with a nice front-end and with the potential to go viral.